Δελτίο τύπου: «DevilStar, billed as the world's first interactive band, earlier this summer released their debut single -- a cover of the Judas Priest classic “Beyond The Realms Of Death”. 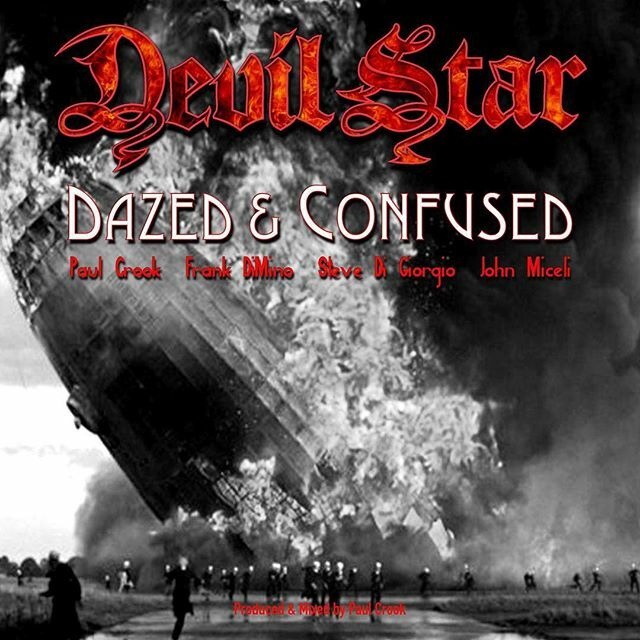 Producer/guitarist Paul Crook (Anthrax, Sebastian Bach, Meat Loaf) and executive producer John Madera reveal the DevilStar recording lineup for the all-star hard rock and heavy metal group’s sophomore outing, a cover of the Led Zeppelin classic “Dazed and Confused” (available July 27th on all digital streaming and download platforms). “Dazed and Confused’s psychedelic-dark vibe really captured me as a young teenager,” explains Paul on his choice to cover the Zep classic. “That descending riff… it’s terrifying. Plant’s performance is mind-blowing. I always felt that the solo section was something out-of-this-world. I love how Bonham and Jones blast off. Page’s solo has everything - great hand tone, cool bends, killer note choice, controlled chaos. Recording this beast was no easy venture. I knew that going in. With the exception of shortening the psychedelic sections, I didn’t see any need to mess with the arrangement. It obviously stands the test of time. Zeppelin kept the tempo raised after the solo section. I thought it might be cool to drop it back down to the intro tempo to cause some uneasiness, tension. My only real goal, besides having fun, was to stay true to Page’s vision while giving the mix a contemporary fatness. I had to take a lot of things into consideration when putting together the band line-up. John Miceli (Blue Oyster Cult, Rainbow) is a badass drummer. He and I have toured the world together with Meat Loaf. I love how he makes his entire drum kit ring. It sounds like one instrument. He hits with so much balance and has a true understanding of how to get his drums to light-up whatever room they are being recorded in. He is a master of his universe. John and I also worked together in the We Will Rock You! – the Las Vegas musical. I can still see Roger Taylor and Brian May gushing over John during the audition process. Brian calls on John for a lot of his music ventures these days. Frank DiMino (Angel)… Frank “The Tank” is probably the biggest Robert Plant fan I know. I wish I had a video recording of the vocal session. He walked in and crushed the song in only a few takes. No song/lyric referencing… Zeppelin is part of his DNA. Frank has great vocal control. He knows where to place things in his voice to get an attractive tone. Frank and I first worked together in 2015 on his solo album Old Habits Die Hard. I handled the production duties. John Miceli played drums. Anyway, we’d see a lot of each other when I was living in Vegas. He makes a great marinara sauce. Subsequent DevilStar single releases – which will be a mix of covers and original material – will feature other notable hard rock/metal names, with Crook handling production and mixing in addition to playing guitar. While several tracks have already been recorded for release in the coming months, fans are invited to email devilstarmusic@gmail.com to propose potential “dream team” lineups and/or suggest cover songs to tackle in the future. Crook first rose to prominence as lead guitarist of thrash pioneers Anthrax in the mid-1990s, when he performed on and toured in support of the group's albums Stomp 442 and Volume 8: The Threat Is Real, the latter of which he also co-produced. In 1999, Crook began a five-year stint as lead guitarist for former Skid Row front man Sebastian Bach. In 2004, he was personally chosen and trained by Queen guitarist Brian May to handle his guitar parts for their musical production of We Will Rock You, which performed for a year on the Las Vegas strip at the Paris Casino Hotel. For the last 15 years, he has served as lead guitarist of Meat Loaf's Neverland Express.